Although it is undeniably true that the winner of Venezuela’s legislative elections last Sunday was the United Socialist Party of Venezuela (PSUV), which sealed a solid and absolute majority in the new National Assembly, there was also another winner: US interference. In all scenarios, PSUV won. It’s an impressive achievement for a political party formed just three years ago, and demonstrates PSUV is the primary political force in the country. With 98 deputies in the National Assembly, PSUV has an absolute majority, followed in second place by opposition party Accion Democratica (AD), which won 22 seats. The other 43 seats in parliament are divided between 9 different political parties. But despite the victory of PSUV in the elections, some key areas were lost to opposition forces, such as in the state of Anzoategui, a solid Chavez-supporting region. Opposition sweeps in the states of Tachira and Zulia, while not suprising, merit analysis. This year was one of the most difficult for the Chavez administration since it came to power in 1999. Electrical energy problems caused by a severe drought during the first semester of the year almost plummeted the nation into collapse. If the government hadn’t implemented a nationwide electricity-rationing plan, the situation would have been unbearable. Nonetheless, entire regions in Venezuela were without regular electricity and water service for months, and this had a major impact on the daily lives of Venezuelans. Even though the principal cause of the energy problem was not the government’s fault, Chavez still took the blame. The global financial crisis had its impact on Venezuela, forcing oil prices to drop and the country’s budget to decrease. Eleven Venezuelan banks were intervened by the state to save customer savings and prevent a bad situation from becoming even worse. The majority of these private banks were either nationalized or liquidated, some for corruption or financial irregularities. If the Chavez administration hadn’t intervened, millions of Venezuelans would have lost all their savings and the social crisis would have been unimaginable. Inflation and speculation encouraged by private enterprise also had a major effect on the daily lives of Venezuelans. Prices of basic consumer products skyrocketed to unaffordable rates. If the state hadn’t expropriated several chains of supermarkets involved in speculation and turned them into a nationwide chain of state-run stores selling products at affordable and accessible prices, millions of Venezuelans would have been without basic food supplies. But the problems of speculation and inflation persist, and instead of recognizing the partial responsibility of private enterprise sabotaging the economy, and consumers willingly paying hiked up prices, the media and others blame Chavez. Despite the government’s efforts to solve these difficult and complex problems, the manipuation perpetuated through mass media, nationally and internationally, ignored the reality and exaggerated the negative, influencing voters’ decisions at the polls. There have also been some very real problems this year, such as the discovery of several tons of decomposed food items in containers owned by the state food program, PDVAL. Despite an investigation into the matter and the detention of those involved, the media exploited the incident to pin corruption and inefficiency on the government. On a regional level, numerous elected officials have failed to follow through on key policies. Others have been consumed by corruption, bureaucracy or incompetence, ignoring the constituents who elected them and causing people to feel abandoned, betrayed and forgotten. A ferocious international media campaign against the Chavez administration has attempted to link the government with terrorism, drug trafficking, authoritarianism and human rights violations, with little, if any, alternative viewpoints. And nationally, the majority-owned private media ran fear campaigns about communism, corruption and dictatorships, in the style of US Cold War propaganda. This context heavily influenced the elections last Sunday and the decisions of voters. The miracle may be not that the opposition won 65 seats, but rather that the PSUV achieved 98. The sound support for President Chavez and his policies demonstrated through this vote evidences a majority in the country still backs his Bolivarian Revolution, despite imperfections, inefficiencies and failures. Another important factor influencing these elections was the multimillion-dollar support the opposition campaign received from US agencies, such as USAID, National Endowment for Democracy (NED), International Republican Institute (IRI) and National Democratic Institute (NDI). These agencies, backing the opposition to Chavez for years, achieved a major result; their most loyal agents won top seats in parliament. During the past eight years, US agencies have been working hard to strengthen opposition forces and help them return to power in Venezuela. The result of Sunday’s elections is their most important victory to date. Efforts backed by US agencies to destabilize Venezuela and force Chavez’s removal from power have not succeeded since the 2002 coup d’etat. Since then, economic sabotages and numerous electoral interventions had failed to produce favorable results for the opposition. The key strategic aid and millions in campaign funding from US and other international agencies – in clear violation of Venezuelan law – helped bring opposition forces together under the MUD coalition and select candidates most likely to win. IRI and NDI set up “campaign schools” and workshops to train candidates and help them develop the right messages to influence voters. US funding helped design campaign propaganda, most of it directed against Chavez. Almost none of the opposition candidates presented alternative policies to attract voters. Their entire campaign was about the threat of “communism” if Chavez stays in power. The political parties that won the most votes in the elections were Primero Justicia, Un Nuevo Tiempo (UNT), AD and Copei – including winning entire states, such as Zulia (UNT) and Tachira (Copei), both strategic regions bordering Colombia of key interest to US policy. Two of these parties, Primero Justicia and UNT were created under 10 years ago with US funding and strategic advice. Their work with them over the decade has finally paid off. The funding and advising invested in one particular candidate, Maria Corina Machado, helped her get the most votes of any candidate on a national level. Machado, founder of the US-funded opposition group Sumate, was the only Venezuelan to be publicly received by President George W. Bush in the White House (with a photo op) throughout his presidency. The discourse of “communism vs. capitalism” was the pillar of Machado’s campaign, and her baby-kissing, plastered-smile style was clearly made in USA. The brutal international media campaign against the Chavez government, primarily in CNN, FOX News, the New York Times and the Washington Post also had a heavy impact on the elections. For weeks, all the news about Venezuela was related to unsubstantiated claims linking Chavez to “terrorism”, “drug trafficking” and even “nuclear weapons”. The US government is pleased. They never thought the opposition would win a majority in the National Assembly, but they did believe that PSUV could achieve a solid two-thirds majority. Their objective was to impede Chavez supporters from achieving the comfortable two-thirds majority, which would have neutralized opposition forces in parliament and rendered them powerless. They won. Although the PSUV has an absolute majority, the presence of US-funded and backed deputies in Venezuela’s legislative body will cause unrest. They won’t be able to roll back any of Chavez’s policies, but they will be able to use this platform to strengthen ties with external allies and prepare their strategy for the 2012 presidential elections. US interference triumphed this time around in Venezuela. The most loyal agents of the US government are now in key positions in Venezuela, where they can create obstacles and challenges for the Chavez government. Now these individuals, many of whom participated in the 2002 coup and subsequent destabilization attempts, can continue with their anti-Chavez agenda, acting with the legitimacy of being representatives of Venezuela’s National Assembly. Most of the press has described Wednesday's European-wide labor demonstrations and strikes across in terms of the familiar exercise by transport workers irritating travelers with work slowdowns, and large throngs letting off steam by setting fires. But the story goes much deeper than merely a reaction against unemployment and economic recession conditions. At issue are proposals to drastically change the laws and structures of how European society will function for the next generation. If the anti-labor forces succeed, they will break up Europe, destroy the internal market, and render that continent a backwater. This is how serious the financial coup d'etat has become. And it is going to get much worse - quickly. As John Monks, head of the European Trade Union Confederation, put it: "This is the start of the fight, not the end." Spain has received most of the attention, thanks to its ten-million strong turnout (reportedly half the entire labor force). Holding its first general strike since 2002, Spanish labor protested against its socialist government using the bank crisis (stemming from bad real estate loans and negative mortgage equity, not high labor costs) as an opportunity to change the laws to enable companies and government bodies to fire workers at will, and to scale back their pensions and public social spending in order to pay the banks more. Portugal is doing the same, and it looks like Ireland will follow suit - all this in the countries whose banks have been the most irresponsible lenders. The bankers are demanding that they rebuild their loan reserves at labor's expense, just as in President Obama's program here in the United States but without the sanctimonious pretenses. The problem is Europe-wide and indeed centered in the European Union capital in Brussels. This is why the major protests were staged there. On the same day that the strikers demonstrated, the neoliberal European Commission (EC) outlined a full-fledged war against labor. Fifty to a hundred thousand workers gathered to protest the proposed transformation of social rules by the most anti-labor campaign since the 1930s - even more extreme than the Third World austerity plans imposed by the IMF and World Bank in times past. The neoliberals are fully in control of the bureaucracy, and they are reviving Margaret Thatcher's slogan, TINA: There Is No Alternative. But there is, of course. In the small Baltic economies, pro-labor parties have made it clear that the alternative to government shrinkage is to simply repeal the debts, withdraw from the Euro and break the banks. It is either the banks or labor - and Europe has just realized that this is truly a fight to the economic death. And the first test will come this Saturday, when Latvia holds its national parliamentary elections. The EC is using the mortgage banking crisis - and the needless prohibition against central banks monetizing the government budget deficit - as an opportunity to fine governments and even drive them bankrupt if they do not agree roll back public-sector salaries. Governments are told to borrow at interest from the banks, rather than raising revenue by taxing them as they have done for half-a century following the end of World War II. And if governments are unable to raise the money to pay the interest, they must close down their social programs. And if this close-down shrinks the economy - and hence, government tax revenues - even more, then the government must shut down even more social spending. From Brussels to Latvia, neoliberal planners have expressed the hope is that lower public salaries will spread to the private sector as well. The aim is to shrink their economies to roll back wage levels by 30 percent or more - depression-style levels - in the belief that this will "leave more surplus" available to pay in debt service. Governments are to tax labor - not finance, insurance or real estate (FIRE), but to impose new employment and sales taxes while cutting back public pensions and public spending. Europe is to be turned into a banana republic. This requires dictatorship, and the European Central Bank (ECB) has assumed this power from elected government. It is "independent" of political control - celebrated as the "hallmark of democracy" by today's new financial oligarchy. But as Plato's dialogues explained it, what is oligarchy but the political stage following democracy. We can now await the new power elite making itself hereditary - by abolishing estate taxes, for starters - and turning itself into an outright aristocracy. "Join the fight against labor, or we will destroy you," the EC is telling governments. One can therefore forget the economics of Adam Smith, John Stuart Mill and the Progressive Era, forget Keynes and forget the early 20th-century social democratic traditions. Europe is entering an era either of totalitarian neoliberal rule. This was inevitable since the Chilean dress rehearsal after 1973. After all, one cannot have "free markets" neoliberal style without totalitarian control. This is what Wednesday's strikes and demonstrations were about, after all. Europe's class war is back in business - with a vengeance! This is economic suicide, but the EU is sticking to its demand that Euro-zone governments keep their budget deficits below 3% of GDP - and their total debt below 60% of GDP. They must not raise taxes on the wealthy, but only on labor and what it buys (via sales taxes). Yet at the same time they must slash wages and pensions, cut back public spending and employment, and shrink the economy. When an economic problem is as economically destructive as this, it can only be imposed by economic blackmail. On Wednesday the EU passed a law to fine governments up to 0.2% of GDP for not "fixing" their budget deficits by imposing fiscal austerity. Nations that borrow to engage in countercyclical "Keynesian-style" spending that raises their public debt level 60% of GDP will have to reduce the excess by 5% each year - or else suffer harsh punishment. And unlike central banks elsewhere in the world, Europe's central bank is forbidden from monetizing public-sector governments. These governments must borrow from banks, letting these institutions create their own interest-bearing debt on their own keyboards rather than having their own central bank do it without the cost. The financial privatization and monopoly in credit creation that governments have relinquished to banks is now being made to pay off - at the price of breaking up Europe. The unelected members of the European Central Bank (ECB, independent from democratic politics, not from control by its commercial bank members) has taken over planning power from elected government. Beholden to its constituency, the financial sector, the ECB has had little trouble in convincing the EU commission to back the new oligarchic power grab. It threatens to fine euro-area states up to 0.1% of their GDP for failure to obey its neoliberal recommendations - ostensibly to "correct" these imbalances. But the reality, of course, is that every neoliberal "cure" only makes matters worse. Rather than seeing rising wage levels and living standards as a precondition for higher labor productivity, the EU commission will "monitor" labor costs on the assumption that rising wages impair competitiveness rather than raise it. The broad spectrum of neoliberal junk economics is being brought to bear. If members of the euro cannot depreciate their currencies, then they must fight labor - but not tax real estate, finance or other rentier sectors, not regulate monopolies, and not provide public services that can be privatized at much higher costs. Privatization is not deemed to impair competitiveness - only rising wages, regardless of productivity considerations. This economically destructive policy has been tested above all in the Baltics, using countries such as Latvia as guinea pigs to see how far labor can be depressed before it reacts politically. Latvia gave free reign to neoliberal policies by imposing flat taxes of 51% on employees, while real estate is taxed at only 1%. Public-sector wages have been reduced by 30%. Labor of working age (20 to 35 year-olds) are emigrating in droves. Lifespans are shortening. Disease rates are rising. The internal market is shrinking, and so is Europe's population - as it did in the 1930s, when the "population problem" was a plunge in fertility and birth rates (above all in France). That is what happens in economic depressions. Iceland's looting by its bankers came first, but the big news was Greece. When that nation entered its current fiscal crisis, European Union officials recommended that it emulate Latvia, which stands as the poster child for neoliberal economic devastation. The basic theory is that inasmuch as members of the euro cannot devalue their currency, they must resort to "internal devaluation": slashing wages, pensions and social spending. So while Europe enters recession it is following precisely the opposite of Keynesian policy. It is reducing wages, ostensibly to "free" more income available to pay the enormous debts that Europeans have taken on to buy their homes, to pay for schooling (hitherto provided freely in many countries such as Latvia's Stockholm School of Economics), transportation and other public services that have been privatized (at sharply, drastically increased rates - which the privatizers justify by pointing to the enormously bloated financial fees they had to pay their bankers and underwriters to buy the infrastructure being sold off by governments that the neoliberals blocked from taxing the wealthy). The result is economic shrinkage. Europe is creating economic suicide - and demographic and fiscal suicide too. Every attempt to "solve" the problem of this shrinkage, neoliberal style, only makes things worse. Latvia's public-sector workers have seen their wages cut by 30 percent over the past year, and its central bankers have told me that they are seeking further cuts, in the hope that this will lower wages in the private sector as well. What these cuts are doing, hardly by surprise, is spurring emigration - and also is destroying the real estate market, leading to defaults, foreclosures and a flight of debtors from the country. The emigration is headed by younger workers seeking employment in the shrinking economy. Indeed, Latvia's working conditions also happen to be Europe's most neoliberalized, that is, dangerous, unpleasant and almost neofeudal. For starters in yesterday's Action Day, there was the usual stoppage of transportation and an accompanying honk concert in Latvia's capital city of Riga for 10 minutes at 1 PM to let the public know that something was indeed happening. What is happening most importantly is the national parliamentary elections this Saturday (October 2), where the leading coalition, Harmony Center, is pledged to enact an alternative tax system and economic policy to the neoliberal policies that have reduced labor's wages and workplace standards so sharply - along with public infrastructure - over the past decade. Altogether about 10,000 Latvians attended protest meetings, from the capital in Riga to smaller cities as part of the "Journey into the Crisis." Six independent trade unions and the Harmony Center organized a protest meeting in Riga's Esplanade Park that drew 700 to 800 demonstrators, relatively large for so small a city. Another union protest saw about half that number gather at the Cabinet of Ministers where Latvia's austerity program has been planned and carried out. To highlight the economic issue, a bus tour drove journalists to the victims - schools and hospitals that had been closed down, government buildings whose employees had seen their salaries slashed and the workforce downsized. Crowds were reported to gather, re-igniting the anger expressed early last year in the cold of mid-January when Latvians had demonstrated to protest the start of these cuts. These demonstrations seem to have gained voter sympathy for the more militant unions, headed by the hundred individual unions belonging to the Independent Trade Union Association. The other union group - the Free Trade Unions (LBAS) lost face by acquiescing in June 2009 to the government's proposed 10% pension cuts (and indeed, 70% for working pensioners). Latvia's constitutional court was sufficiently independent to overrule these drastic cuts last December. And if the government does indeed change this Saturday, the conflict between the Neoliberal Revolution and the past few centuries of classical progressive reform will be made clear. The Neoliberal Revolution seeks to achieve in Europe what has been achieved in the United States since 1979, when real wages stopped rising. The aim is to double the relative share of wealth enjoyed by the richest 1%. This involves reduce the population to poverty, breaking union power, and destroying the internal market as a precondition for blaming all this on "Mr. Market," presumably inexorable forces beyond politics, purely "objective" rather than a political power grab. It is not really "the market" that is promoting this destructive economic austerity, of course. Latvia's Harmony Center shows that there is a much easier way to cut the cost of labor in half than by reducing its wages: Simply shift the tax burden off labor onto real estate and monopolies (especially privatized infrastructure). This will leave less of the economic surplus to be capitalized into bank loans, lowering the price of housing accordingly (the major factor in labor's cost of living), as well as the price of public services (by having owners take their returns as a return on equity rather than factoring interest charges into their cost of doing business). The tax deductibility of interest will be repealed - there is nothing intrinsically "market dictated" by this fiscal subsidy for debt leveraging. Britain is said to be approaching its Berlusconi Moment. That is to say, if Rupert Murdoch wins control of Sky he will command half the television and newspaper market and threaten what is known as public service broadcasting. Although the alarm is ringing, it is unlikely that any government will stop him while his court is packed with politicians of all parties. The problem with this and other Murdoch scares is that, while one cannot doubt their gravity, they deflect from an unrecognised and more insidious threat to honest information. For all his power, Murdoch’s media is not respectable. Take the current colonial wars. In the United States, Murdoch’s Fox Television is almost cartoon-like in its warmongering. It is the august, tombstone New York Times, “the greatest newspaper in the world”, and others such as the once-celebrated Washington Post, that have given respectability to the lies and moral contortions of the “war on terror”, now recat as “perpetual war”. In Britain, the liberal Observer performed this task in making respectable Tony Blair’s deceptions on Iraq. More importantly, so did the BBC, whose reputation is its power. In spite of one maverick reporter’s attempt to expose the so-called dodgy dossier, the BBC took Blair’s sophistry and lies on Iraq at face value. This was made clear in studies by Cardiff University and the German-based Media Tenor. The BBC’s coverage, said the Cardiff study, was overwhelmingly “sympathetic to the government’s case”. According to Media Tenor, a mere two per cent of BBC news in the build-up to the invasion permitted anti-war voices to be heard. Compared with the main American networks, only CBS was more pro-war. So when the BBC director-general Mark Thompson used the recent Edinburgh Television Festival to attack Murdoch, his hypocrisy was like a presence. Thompson is the embodiment of a taxpayer-funded managerial elite, for whom political reaction have long replaced public service. He has even laid into his own corporation, Murdoch-style, as “massively left-wing”. He was referring to the era of his 1960s predecessor Hugh Greene, who allowed artistic and journalistic freedom to flower at the BBC. Thompson is the opposite of Greene; and his aspersion on the past is in keeping with the BBC’s modern corporate role, reflected in the rewards demanded by those at the top. Thompson was paid £834,000 last year out of public funds and his 50 senior executives earn more than the prime minister, along with enriched journalists like Jeremy Paxman and Fiona Bruce. Murdoch and the BBC share this corporatism. Blair, for example, was their quintessential politician. Prior to his election in 1997, Blair and his wife were flown first-class by Murdoch to Hayman Island in Australia where he stood at the Newscorp lectern and, in effect, pledged an obedient Labour administration. His coded message on media cross-ownership and de-regulation was that a way would be found for Murdoch to achieve the supremacy that now beckons. Blair was embraced by the new BBC corporate class, which regards itself as meretorious and non-ideological: the natural leaders in a managerial Britain in which class is unspoken. Few did more to enunciate Blair’s “vision” than Andrew Marr, then a leading newspaper journalist and today the BBC’s ubiquitous voice of middle-class Britain. Just as Murdoch’s Sun declared in 1995 it shared the rising Blair’s “high moral values” so Marr, writing the Observer in 1999, lauded the new prime minister’s “substantial moral courage” and the “clear distinction in his mind between prudently protecting his power base and rashly using his power for high moral purpose”. What impressed Marr was Blair’s “utter lack of cynicism” along with his bombing of Yugoslavia which would “save lives”. By March 2003, Marr was the BBC’s political editor. Standing in Downing Street on the night of the “shock and awe” assault on Iraq, he rejoiced at the vindication of Blair who, he said, had promised “to take Baghdad without a bloodbath, and that in end the Iraqis would be celebrating. And on both of those points he has been proved conclusively right” and as a result “tonight he stands as a larger man”. In fact, the criminal conquest of Iraq smashed a society, killing up to a million people, driving four million from their homes, contaminating cities like Fallujah with cancer-causing poisons and leaving a majority of young children malnourished in a country once described by Unicef as a “model”. So it was entirely appropriate that Blair, in hawking his self-serving book, should select Marr for his “exclusive TV interview” on the BBC. The headline across the Observer’s review of the interview read, “Look who’s having the last laugh.” Beneath this was a picture of a beaming Blair sharing a laugh with Marr. Instead, Blair used the convivial encounter to deceive, yet again, even to promote an attack on Iran, an outrage. Murdoch’s Fox would have differed in style only. The British public deserves better. Plusieurs centaines d'infirmiers-anesthésistes ont bloqué l'avenue des Champs-Elysées et la rue de Washington vendredi 1er octobre à la mi-journée pour demander une reconnaissance de leur diplôme au niveau master avant la fin de l'année. D'après le site actusoins.com, 2.000 manifestants en blouse bleue se seraient donné rendez-vous devant le restaurant le Fouquet's qui avait accueilli Nicolas Sarkozy au soir de sa victoire à la présidentielle de 2007. Le siège de l'UMP, protégé par un cordon de CRS, était également pris d'assaut par des infirmiers mécontents. Selon des images diffusées par la chaîne Itélé, ils se dirigent vers le palais de l'Elysée. Les forces de l'ordre auraient essayé de repousser les manifestants à l'aide de bombes lacrymogènes et procèdent désormais à des interpellations. Le 18 mai dernier, plusieurs dizaines de manifestants avaient déjà bloqué la gare Montparnasse pour dénoncer la non-reconnaissance de la formation d'anesthésiste par le protocole Bachelot.Ils critiquaient également le fait que des infirmiers n'ayant pas suivi leurs deux années de formation puissent pratiquer des actes d'anesthésie. Au bout de 5 heures, des CRS avaient du intervenir pour dégager les voies et permettre la reprise du trafic ferroviaire. A la suite de cette opération coup-de-poing, Roselyne Bachelot avait promis que la revalorisation du diplôme sur la grille des salaires aurait lieu "avant la fin de l'année" 2010. Está desempregado há dois anos e tem como único rendimento uma pensão de viuvez de 160 euros. Na semana passada, Artur Ferreira da Silva, de Rebordosa, Paredes, abriu uma carta endereçada pela Direcção-Geral de Impostos e encontrou um cheque no valor de 14 cêntimos. Tratava-se do reembolso do IRS. Mais do que espantado, este homem de 44 anos está indignado com aquilo que classifica como "uma estupidez". "Fiquei espantado que as Finanças me enviassem um cheque com um valor inferior aos custos do correio. Gasto mais em gasóleo só para depositar o cheque", refere, incrédulo. "Entendo que isto só pode ser para gozar com os pobres. Podiam perfeitamente ficar com o dinheiro e, se quisessem, descontar nos anos seguintes", sugere ainda. 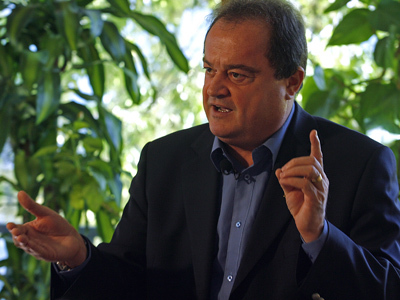 Mesmo assim, Artur Ferreira da Silva garante que vai depositar o cheque na sua conta. Não sem antes tirar uma fotocópia para mais tarde recordar. "Acho que estão a brincar quando enviam um valor inferior ao próprio custo do papel", defende. Entre os amigos de Artur, quase todos partilham da posição do beneficiário dos 14 cêntimos. "É o país que temos. Está tudo desorganizado", acusa Mário Santos. From Brussels to Latvia, neoliberal planners have expressed the hope that lower public-sector salaries will spread to the private sector. The aim is to roll back wage levels by 30 per cent or more, to depression levels, on the pretense that this will “leave more surplus” available to pay in debt service. It will do no such thing, of course. It is a purely vicious attempt to reverse Europe’s Progressive Era social democratic reforms achieved over the past century. Europe is to be turned into a banana republic by taxing labor – not finance, insurance or real estate (FIRE). Governments are to impose heavier employment and sales taxes while cutting back pensions and other public spending. This is economic suicide, but the EU is demanding that Euro-zone governments keep their budget deficits below 3 per cent of GDP, and their total debt below 60 per cent. On Wednesday the EU passed a law to fine governments up to 0.2 per cent of GDP for not “fixing” their budget deficits by imposing such fiscal austerity. Nations that borrow to engage in countercyclical “Keynesian-style” spending that raises their public debt beyond 60 per cent of GDP will have to reduce the excess by 5per cent each year, or suffer harsh punishment. The European Commission (EC) will fine euro-area states that do not obey its neoliberal recommendations – ostensibly to “correct” budget imbalances. The financial privatization and credit-creation monopoly that governments have relinquished to banks is now set to pay off – at the price of breaking up Europe. Unlike central banks elsewhere in the world, the charter of the European Central Bank (ECB, independent from democratic politics, not from control by its commercial bank members) forbids it to monetize government debt. Governments must borrow from banks, which are create interest-bearing debt on their own keyboards rather than having their national bank do it without cost. The unelected members of the European Central Bank have taken over planning power from elected governments. Beholden to its financial constituency, the ECB has convinced the EU commission to back the new oligarchic power grab. This destructive policy has been tested above all in the Baltics, using them as guinea pigs to see how far labor can be depressed before it fights back. Latvia gave free rein to neoliberal policies by imposing flat taxes of 51 per cent and higher on labor, while real estate is virtually untaxed. Public-sector wages have been reduced by 30 per cent, prompting labor of working age (20 to 35 year-olds) to emigrate in droves. This of course is contributing to the plunge in real estate prices and tax revenue. Lifespans for men are shortening, disease rates are rising, and the internal market is shrinking, and so is Europe’s population – as it did in the 1930s, when the “population problem” was a plunge in fertility and birth rates (above all in France). That is what happens in a depression. So Europe is committing economic, demographic and fiscal suicide. Trying to “solve” the problem neoliberal style only makes things worse. Latvia’s public-sector workers, for example, have seen their wages cut by 30 per cent over the past year, and its central bankers have told me that they are seeking further cuts, in the hope that this will lower wages in the private sector as well, just as neoliberals in other European countries hope, as noted above. About 10,000 Latvians attended protest meetings in the small town of Daugavilpils alone as part of the “Journey into the Crisis.” In Latvia’s capital city, Riga, Wednesday’s Action Day saw the usual stoppage of transportation and an accompanying honk concert for 10 minutes at 1 PM to let the public know that something was happening. Six independent trade unions and the Harmony Center organized a protest meeting in Riga’s Esplanade Park that drew 700 to 800 demonstrators, relatively large for so small a city. Another union protest saw about half that number gather at the Cabinet of Ministers where Latvia’s austerity program has been planned and carried out. These demonstrations seem to have gained voter sympathy for the more militant unions, headed by the hundred individual unions belonging to the Independent Trade Union Association. The other union group – the Free Trade Unions (LBAS) lost face by acquiescing in June 2009 to the government’s proposed 10per cent pension cuts (and indeed, 70per cent for working pensioners). Latvia’s constitutional court was sufficiently independent to overrule these drastic cuts last December. And if the government does indeed change this Saturday, the conflict between the Neoliberal Revolution and the past few centuries of classical progressive reform will be made clear. In sum, the Neoliberal Revolution seeks to achieve in Europe what the United States has achieved since real wages stopped rising in 1979: doubling the share of wealth enjoyed by the richest 1 per cent. This involves reducing the middle class to poverty, breaking union power, and destroying the internal market as a precondition. Latvia’s Harmony Center program shows that there is a much easier way to cut the cost of labor in half than by reducing its wages: Simply shift the tax burden off labor onto real estate and monopolies (especially privatized infrastructure). This will leave less of the economic surplus to be capitalized into bank loans, lowering the price of housing accordingly (the major factor in labor’s cost of living), as well as the price of public services. (Owners of monopoly utility services would be prevented from factoring interest charges into their cost of doing business. The idea is to encourage them to take returns on equity. Whether or not they borrow is a business decision of theirs, not one that governments should subsidize.) The tax deductibility of interest will be repealed – there is nothing intrinsically “market dictated” by this fiscal subsidy for debt leveraging. This program may be reviewed at rtfl.lv, the Renew Task Force Latvia website. En 2010, un tiers des Français âgés de 15 ans et plus dit avoir déjà fait l’expérience de la pauvreté. Les profils de ces Français qui ont à un moment de leur vie connu la précarité sont divers, mais les personnes aux revenus les plus modestes sont surreprésentées : la majorité de ceux qui ont connu la pauvreté appartiennent aujourd’hui à un foyer dont le revenu mensuel net est inférieur à 2 000€. 70 % ont un niveau d’études inférieur au bac. Ce chiffre est d’autant plus alarmant qu’il est en hausse (+3 points par rapport à 2009), alors qu’il était resté stable entre 2007 et 2009. L’écart observé entre 2009 et 2010 confirme ainsi les prévisions inquiétantes de l’Observatoire National de la Pauvreté et de l’Exclusion Sociale (ONPES) quant à l’importance de l’impact de la crise sur la pauvreté. Sans surprise, ce sont les catégories sociales les moins favorisées qui ont été les plus impactées par la crise : 47% des ouvriers déclarent en 2010 avoir déjà connu une situation de pauvreté (soit +19 points par rapport à 2009) et 29% des inactifs (+7 points). Les Français aux revenus les plus modestes (revenu net mensuel du foyer inférieur à 1 200 €) ont vraisemblablement vécu une année particulièrement difficile : 61% d’entre eux disent avoir déjà connu la pauvreté (+7 points par rapport à 2009). Lire l'intégralité de ce sondage sur le site de l'IPSOS. Consulter le site de l'Observatoire National de la Pauvreté et de l’Exclusion Sociale. Les villes face à "l'insécurité"
Le débat sur l’insécurité n’est pas un fait nouveau, mais revêt aujourd’hui une acuité toute particulière dans la société française, notamment en Île-de-France. Il s’est installé sur le devant de la scène politique et médiatique, durablement inscrit sur les agendas nationaux et locaux. Cette construction de l’insécurité comme catégorie de l’action publique s’appuie sur des outils permettant de quantifier les délinquances et leurs évolutions. Quelles perspectives d’avenir pour le gouvernement de la sécurité dans nos villes ? Au-delà des réorganisations de la sécurité publique, s’achemine-t-on vers une privatisation de la protection des biens et des personnes ? En tout cas, le secteur marchand de la sécurité est en plein essor. Et sur le plan urbain, dans quelle mesure les contextes nationaux influencent-ils le développement d’espaces résidentiels sécurisés, centrés sur un entre-soi protecteur ? Cette publication de l'Institut d'aménagement et d'urbanisme de la Région Ile-de-France permet de faire un vaste tour d'horizon des problématiques actuelles. Par-delà les statistiques officielles, la connaissance de ces phénomènes s’est consolidée avec le développement d’enquêtes en population générale : les enquêtes de délinquance auto-reportée et les enquêtes de victimation, à l’instar de celle que mène l’IAU îdF à l’échelle régionale depuis 2001. Assurément, ce n’est plus l’affaire des seuls services de l’État. Outre l’essor du secteur privé, on assiste au retour en force des pouvoirs locaux dans le gouvernement de la sécurité des villes. Parallèlement, on observe une prise en compte accrue des questions de sécurité dans le champ de l’urbanisme. Les modes de production de la sécurité urbaine sont en pleine recomposition. Une redistribution des rôles s’opère entre les institutions étatiques, les collectivités locales, le monde associatif et le secteur privé, à l’articulation de différentes stratégies de lutte contre l’insécurité. La problématique de l’insécurité urbaine reflète les processus de ségrégation socio-spatiale en même temps qu’elle les alimentent. Dans les banlieues « sensibles », les délinquances juvéniles sont avant tout le symptôme d’une condition sociale dégradée. L’insécurité ne pèse pas moins sur l’attractivité des commerces, la qualité des espaces et l’expérience vécue des habitants dans ces quartiers populaires qui s’apparentent à maints égards à de véritables « ghettos urbains ». Télécharger cette publication sur le site de l'IAU-IDF. Com os poucos dados que se dispõem não é ainda possível avaliar total e rigorosamente as consequências de todas as medidas anunciadas por Sócrates, até porque elas ainda não foram passadas para diplomas. No entanto, com base no comunicado emitido pelo Ministério das Finanças em 30/09/2010, disponível no seu “site”, o qual clarifica alguns pontos que tinham ficado poucos claros na conferencia de imprensa dada pelo governo, é possível, sem prejuízo de uma análise futura mais completa e rigorosa, quantificar algumas das medidas para se poder avaliar não só as graves consequências sociais que provocarão, mas também as económicas cuja gravidade não é menor mas que muitas vezes são esquecidas ou intencionalmente omitidas. As medidas do governo de Sócrates vão provocar não só uma agravamento grande e imediato das condições de vida dos trabalhadores e dos pensionistas, mas também terão um impacto enorme a nível económico, provocando certamente uma forte retracção da economia (mesmo recessão), já que determinarão uma redução drástica adicional do consumo interno (4.855 milhões €, sendo 173 milhões € de investimento), o que causará a falência de muitas empresas, fazendo disparar ainda mais do desemprego. Só a miopia deste governo, e do PSD e CDS, que exigem a redução drástica da despesa pública, ignorando as consequências gravíssimas numa situação de grave crise como é actual, é que parecem não compreender isso. Sócrates e o seu ministro das Finanças anunciaram que o IVA seria aumentado em 2011 em 2 pontos percentuais. Como esse aumento é apenas na taxa normal, ou seja, na taxa de 21% segundo o comunicado, o aumento do imposto é o constante do quadro 1. Tendo como base a estrutura da despesas e da receita do IVA em 2010, o aumento de receita do IVA obtida com uma subida de 2 pontos percentuais na taxa normal (21%) e tendo em conta o crescimento do PIB em termos nominais deverá rondar os 1.178 milhões € em 2011, o que corresponde a uma subida de receita, relativa à prevista em 2010, de 9,2%. Mas não é só devido a esta medida que os impostos vão aumentar. Sócrates também anunciou que o rendimento dos reformados não sujeito a imposto (a chamada dedução de pensões a nível do IRS) irá ser reduzida dos actuais 6.000€ por ano para um valor que poderá ser apenas 3.888€, que é a dedução por rendimentos do trabalho. Portanto, se um reformado receber uma pensão superior ao salário mínimo nacional, mesmo que a sua pensão seja congelada em 2011, o IRS que pagará poderá aumentar, pelo menos, em 168,96€, pois 2.112€ do seu rendimento ficarão sujeitos a IRS, o que não acontecia em 2010. A juntar a tudo isto, e por pressão fundamentalmente do CDS, o governo também anunciou na conferencia de imprensa que irá reduzir administrativamente a despesa com o Rendimento Social de Inserção em 20%, ou seja, uma redução de 116 milhões € por ano, o que só se conseguirá retirando o apoio social a mais de 100.000 portugueses com rendimento abaixo do limiar da pobreza, pois o subsidio por pessoa é actualmente apenas de 88,92€ por mês. O governo de Sócrates pretende não só congelar mais uma vez em 2011 (já o fez em 2010) as remunerações dos trabalhadores da Função Pública que recebem até 1500€ por mês, mas também reduzir as remunerações dos trabalhadores que recebem mais de 1500€ por mês, entre 3% e 10%, de forma a obter uma redução do total de remunerações pagas à Função Pública em 5%. Se esse for objectivo do governo, e se ele se concretizar, a redução em milhões € nos vencimentos dos trabalhadores será a que consta do quadro 2, a que se deve juntar o aumento da taxa de contribuição para a CGA a aplicar a todos que descontam para esta instituição também anunciada pelo governo. O governo pretende aumentar em 1 ponto percentual o desconto dos trabalhadores da Função para a CGA. Para se compreender a injustiça desta medida é preciso ter presente que os trabalhadores da Função Pública já descontam nos seus salários, para pagar a saúde e a reforma. 11,5% (10% para a CGA e 1,5% para a ADSE), enquanto os do sector privado descontam 11%. E como tudo isso não fosse suficiente o governo pretende agora aumentar em mais 1 ponto percentual, ou seja, para 12,5%, o que significa um novo corte nas remunerações dos trabalhadores da Função Pública em 124 milhões € por ano. Como o número actual de subscritores da CGA é de 603.840, isso significa uma redução média anual nas remunerações de 237€ por trabalhador. E ainda têm de pagar impostos como qualquer trabalhador. Durante a conferencia de imprensa o governo anunciou que tenciona aumentar a taxa de desconto dos trabalhadores para a CGA já este ano, o que poderá custar aos trabalhadores da Administração Pública uma redução nas suas remunerações em 2010, que foram congeladas, estimada em 41 milhões €. Para além disso, o governo pretende ainda cortar nas remunerações dos trabalhadores da Função Pública que recebem mais de 1500€ por mês entre 3% e 10%, de forma que obtenha uma redução da massa salarial da Função em 5%. Se essa redução tiver como base apenas as remunerações certas e permanentes a diminuição será de 425 milhões por ano, mas se for de 5% das Despesas de Pessoal da Função Pública a redução já será de 573 milhões € por ano. O director da OCDE, quando esteve em Portugal, aconselhou o governo a reduzir os salários da Administração Pública porque isso determinaria, por arrastamento, o mesmo no sector privado. O governo, obedientemente, seguiu o conselho, por isso é previsível que procure ajudar os patrões privados a fazerem o mesmo. Na conferência de imprensa nem Sócrates nem Teixeira dos Santos foram claros. Portanto, teremos de esperar pelos projectos de diplomas para saber ao certo. Mas o que ficou na conferência de imprensa claro, tendo Teixeira dos Santos até mesmo corrigido o 1º ministro na tentativa deste para ocultar a verdade: é que os trabalhadores nunca serão no futuro compensados por este corte na suas remunerações. A gravidade desta medida só fica clara se se tiver presente que a maioria dos trabalhadores atingidos por este corte são os trabalhadores mais qualificados da Administração Pública (médicos, enfermeiros, professores, técnicos superiores, etc), que muitos deles já são insuficientes na Administração Pública (recorde-se a situação a nível de médicos, em que milhares de portugueses não têm médico de família) e medidas como esta só poderão levar ao agravamento da situação actual. Esta é uma forma de destruição do SNS, e dos serviços públicos, que Sócrates em palavras diz defender. E esta situação ainda ganha foros mais graves se se tiver presente outra medida anunciada também por Sócrates: o congelamento total das entradas na Administração Pública o que determinará a rápida degradação dos serviços públicos prestados à população e o aumento desemprego (a partir de agora, nenhum jovem conseguirá arranjar emprego na A. Pública). A PT, para distribuir todos anos elevados dividendos aos seus accionistas, não tem provisionado o Fundo de Pensões dos trabalhadores nas importâncias necessárias. No fim de 2009, as responsabilidades do Fundo de Pensões eram superiores a 2.265 milhões € (actualmente já devem rondar os 2.400 milhões €), e o valor dos activos do Fundo, que servem para pagar as pensões, era apenas de 1617 milhões €, ou seja, estavam em falta 648 milhões €. O valor do fundo nem dava para pagar as pensões dos trabalhadores já reformados, e muito menos para pagar as pensões correspondentes ao tempo de serviço prestado pelos trabalhadores no activo. Mesmo aquele valor do Fundo em 1617 milhões € era pouco seguro pois mais de 40% estava investido em acções, portanto um activo de elevado risco, e ainda maior numa altura de grande instabilidade nos mercados financeiros. Apesar desta situação ser conhecida pela entidade reguladora, que é o Instituto de Seguros de Portugal, ela nunca fez nada para obrigar a PT a corrigir rapidamente a situação, o que prova que também neste sector a entidade reguladora está refém dos grandes grupos económicos. E agora aparece o governo de Sócrates com a estranha decisão de pretender integrar o Fundo de Pensões da PT na Segurança Social ou na CGA, numa das suas habituais manobras de engenharia financeira para, assim, reduzir artificialmente a Dívida Pública (recebe agora, e paga pensões no futuro quando já Sócrates não estiver no governo, embora não se saiba o certo o que se pagará). É certamente um bom negócio para a PT que assim se livrará das pesadas responsabilidades actuais e futuras do seu Fundo de Pensões, que são muito grandes, transferindo-as para o Estado, ou melhor, para a Segurança Social ou para a CGA, mas é um negócio que poderá por em perigo a sustentabilidade financeira da própria Segurança Social, se for esta a escolhida pelo governo e as reformas de milhões de trabalhadores portugueses, ou mais impostos para a financiar a CGA se for esta o instrumento utilizado pelo governo. É necessário que os trabalhadores e as suas organizações estejam muito atentos a esta questão, pois a estabilidade financeira da Segurança Social ou da CGA poderão estar em perigo, e é uma questão muito importante para todos os trabalhadores portugueses. A experiência já mostrou suficientemente aos portugueses que não se pode acreditar neste governo, que um dia diz uma coisa para pouco depois fazer o contrário, e ele naturalmente vai dizer que é “bom” para Segurança Social e para a CGA. Mas só acredita quem quiser e mesmo assim não deve esquecer a experiência recente para não poder dizer mais tarde que foi enganado mais um vez. Uma coisa é certa: quem esteja familiarizado e conheça quais são os riscos de um fundo de pensões sabe bem que nunca se sabe ao certo a quantia necessária para se pagar no futuro as pensões, portanto o risco é grande, e a PT, como boa gestora defensora dos interesses dos seus accionistas, quer-se livrar dessa responsabilidade, e o governo de Sócrates parece querer-lhe fazer o “frete”. Seria bom não esquecer e reflectir sobre exemplos passados. Para finalizar, quantificaram-se as várias medidas utilizando as percentagens do PIB constantes do comunicado do Ministério das Finanças, cujos resultados estão no quadro seguinte. La semana pasada, y dentro de las constantes manifestaciones que se estan celebrando en Bucarest desde comienzos de septiembre, tuvo lugar una gran concentración en la Plaza Victoria de la capital, frente a la sede del gobierno rumano. Los policias, muchos de ellos portando su uniforme oficial, protestaban ante la evidente agresión a los derechos de los trabajadores públicos, y por evidentes consecuencias del resto, que han sufrido un recorte en sus salarios de un 25% (de un salario ya de partido casi ridículo). El ataque a su bolsillo y a su subsistencia, como a la de los pensionistas, se agrava por la subida del IVA y los recortes en servicios y ayudas publicas. 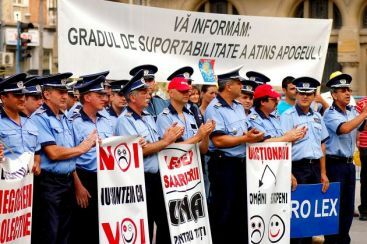 Como los policias son también trabajadores públicos (en Rumania no existe el concepto de funcionario tal y como nosotros lo entendemos) han salido a la calle esta vez para exigir sus derechos, y no para vigilar la propiedad privada, especialmente de las mas grandes, y hasta han tenido que tener algunos enfrentamientos con el resto de policias que no hacian huelga, en su papel de piquetes del capital. El hecho es que los cabreados policias exigian que el presidente de la Republica de Rumania, Traian Basescu, acudiera a negociar con ellos a Piata Victoriei, y en caso de que no lo hiciera, ellos mismos irian a la sede de la Presidencia, el Palacio de Cotroceni, a hablar con el. Esto ultimo fue lo que sucedio, y los policias emprendieron una marcha no autorizada (del tipo que suelen reprimir habitualmente) por las calles del centro de Bucarest hasta el lujoso palacio del presidente. Ante sus puertas gritaron contra el presidente, llamandole "ladron", o pidiendo su dimision, y algunas cosas mas fuertes, y lanzaron sus gorras oficiales al jardin del palacio (lo que parece ofendio profundamente el orgullo nacional del presidente, aunque que los rumanos se mueran de hambre parece que no le afecta lo mas minimo). En definitiva, y tras los problemas, leves enfrentamientos, gritos, etc... a las puertas del gran palacio, el presidente se cabreo y pidio que la policia rumana ya no le escolte jamas de los jamases en sus paseos oficiales por Rumania. Aparte de eso, insulto a algunos de sus dirigentes, denuncio que usaran el uniforme y que algunos llevaran pistolas. Incluso llego a decir que fue un acto de subversion contra la maxima institucion del estado. Por todo ello, y aparte de la renuncia a los servicios de escolta por parte de Basescu y, por imitacion, Boc (algo que demuestra la consideracion que tienen ambos de la policia, como si su labor de proteccion fuera una cuestion de capricho personal, es decir, como si fuera suya), la consecuencia principal fue la dimision del ministro Vasile Blaga (en la foto, donde se puede ver que no se trata de un trabajador). Se trata de uno de los hombres fuertes del partido en el poder, el Partido Democrata Liberal (un nido de oportunistas, como el resto de los partidos), y parece que también hay detras luchas instestinas por el control del poder. Sin embargo, y esto es lo importante, las manifestaciones de la policia (y de otros trabajadores del Ministerio de Interior) tuvo como consecuencia la dimision del ministro, que es todo un exito (que un tipo del estilo de los politicos profesionales del capitalismo abandone su sillon bienremunerado y las conexiones lucrativas que lo acompañan tras una demostracion de los trabajadores (aunque sean policias) es todo un exito del movimiento sindical (a pesar de que los trabajadores hubieran preferido que la dimision fuera del gobierno en pleno. No hay que olvidar que el ministro dimitido estaba ya con las riendas del Ministerio de Interior cuando Basescu ganó por la mínima las elecciones presidenciales el pasado diciembre, iniciando su segundo mandato bajo acusaciones de un fraude mas que probable. Y el que dirigio y controlo el proceso electoral era Blaga (por cierto que de esto ya no se habla apenas en la prensa, ni siquiera la oposicion que tanto escandalo monto, lo que demuestra que las disputas y diferencias entre los partidos del regimen capitalista son solo la fachada de una completa identidad de intereses economicos e ideologicos (en los que el pueblo solo es un invitado decorativo). O economista Eugénio Rosa, da CGTP, prevê que as maiores contribuições e os menores salários na Função Pública poderão dar origem à saída de trabalhadores altamente qualificados. A CGTP indicou que o aumento da contribuição de um por cento para a Caixa Geral de Aposentações vai resultar em que 600 mil trabalhadores vão pagar, em média, mais 237 euros em 2011. De acordo com as contas feitas pelo economista Eugénio Rosa, que pertence a esta central sindical, alguns trabalhadores da Função Pública poderão perder em 2011 cerca de 1700 euros e que muitos destes funcionários altamente qualificados poderão ponderar a sua saída. «São grupos com qualificações elevadas que têm maior possibilidade de arranjar emprego cá fora. Se começa a atingir muito estes trabalhadores naturalmente vai haver uma saída muito maior e isso tem reflexos muito grandes no funcionamento da Administração Pública», acrescentou. Em declarações à TSF, este economista revelou ainda que as classes mais atingidas por estes cortes são os médicos, mas também outras profissões que poderão ficar numa situação de «desmotivação, mal-estar e até irritação». Carvalho da Silva propôs uma «unidade de acção» com outras organizações sindicais para a greve geral da CGTP de 24 de Novembro, deixando assim o convite à participação da UGT. O secretário-geral da CGTP convidou a UGT a juntar-se à greve geral da central sindical liderada por Carvalho da Silva, marcada para 24 de Novembro. Na comemoração dos 40 anos de actividade da CGTP, o líder desta central sindical propôs uma «unidade de acção às organizações sindicais». A CGTP apelou ainda à «mobilização dos trabalhadores com forte sentido de responsabilidade» para fazer uma «grande greve geral». Após o seu discurso, Carvalho da Silva confirmou que já foi «endereçada uma solicitação de encontro à direcção da UGT antes deste anúncio». «Eu próprio tive um contacto telefónico com João Proença e esperamos que haja uma discussão séria sobre isto. A nossa decisão foi propor aos trabalhadores a realização de uma greve com a convicção de que ela é para fazer», acrescentou o líder da CGTP, em declarações à TSF. A escola básica n.º 1 Frei Luís de Sousa, em Lisboa, encontra-se hoje, sexta-feira, de manhã fechada a cadeado pelos pais e encarregados de educação dos alunos que contestam as "condições de higiene do estabelecimento" e exigem mais auxiliares. João Cardoso, um dos pais que se encontra em frente à escola, relatou à agência Lusa que o estabelecimento tem apenas duas auxiliares para 220 alunos. "Cada auxiliar devia ter apenas a responsabilidade por cada grupo de 48 crianças e isso não acontece", reclama este pai. Relata ainda que os 220 alunos têm ao seu dispor apenas uma única casa de banho, que tem funcionado quer para rapazes quer para raparigas. "A escola tem uma manifesta falta de higiene. Não tem papel higiénico muitas vezes e a alimentação é péssima", afirma ainda João Cardoso. Anabela Pereira, avó de uma menina que frequenta a Frei Luís de Sousa, também se mostra revoltada com a "falta de condições da escola". À Lusa esta avó contou que a neta partiu o pé enquanto estava nas escola e nada foi comunicado aos pais até à hora de saída. "Esteve desde as 12.00 até às 17:00 com o pé partido e quando fui com ela ao hospital já tinha ganhado líquido no tornozelo e deve ter de ser operada. Nada me disseram da escola", relatou, indignada. A PSP encontra-se já nas instalações da escola básica Frei Luís de Sousa, segundo adiantaram à Lusa pais e encarregados de educação. A UGT ainda se encontra a avaliar a eventual adesão à greve geral convocada pela CGTP contra as medidas de austeridade anunciadas pelo Governo, disse hoje à Lusa fonte da central sindical. "Ainda não foi tomada uma decisão, mas não está descartada a hipótese de ir para a greve", disse hoje à Lusa fonte da UGT, admitindo que "a decisão ainda pode ser tomada durante o dia de hoje". O secretário-geral da CGTP propôs hoje a unidade de acção para a greve geral de 24 Novembro, deixando assim o convite à participação da UGT no protesto contra as medidas de austeridade anunciadas pelo Governo. "Propomos unidade de acção às organizações sindicais", afirmou hoje Carvalho da Silva, que falava na assembleia de dirigentes e ex-dirigentes sindicais, na comemoração dos 40 anos de actividade da central. 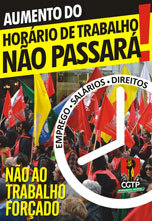 A CGTP apela à "mobilização dos trabalhadores com forte sentido de responsabilidade" para fazer uma "grande greve geral". As decisões foram tomadas na quinta feira pelo conselho nacional da CGTP, que foi o mais participado do mandato, segundo Carvalho da Silva. O Governo anunciou na quarta feira um conjunto de medidas de austeridade com o objectivo de consolidar as contas públicas. Entre essas medidas estão o corte de salários de cinco por cento no total da massa salarial da Função Pública, o congelamento das pensões em 2011 e o aumento em dois pontos percentuais do IVA, que passará a ser de 23 por cento. As restantes taxas do IVA também vão ser revistas. 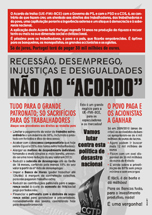 Os Trabalhadores Social Democratas (TSD) declararam-se hoje "solidários" com as medidas das organizações sindicais para contestar o "pacote de austeridade" que penaliza os trabalhadores e introduz "tendências recessivas na economia". Questionado sobre a adesão à greve geral convocada pela CGTP para o dia 24 de Novembro, o dirigente dos TSD, Pedro Roque, destacou que esta organização está "solidária com as medidas" das restantes organizações dos trabalhadores e criticou "as contradições" do Governo. "O Governo ganhou as eleições com base num cenário cor de rosa, afastou as hipóteses de redução salarial e, de um momento para o outro surge um pacote brutal [de medidas] que penaliza os trabalhadores e introduz tendências recessivas na economia", salientou. Para Pedro Roque, "o PEC II [medidas de austeridade anunciadas em maio] seria suficiente se tivesse sido cumprido", mas a "política económica do Governo não inspira confiança nos investidores e nos mercados e faz com que a despesa seja galopante". O Governo anunciou, na quarta feira, um conjunto de medidas de austeridade com o objectivo de consolidar as contas públicas, que incluem, por exemplo, o corte de salários de 5 por cento na Função Pública, o congelamento das pensões em 2011 e o aumento em dois pontos percentuais do IVA, que passará a ser de 23 por cento. O dirigente dos TSD considerou, no entanto, que "a cura pode ser de tal maneira que pode fazer com que o doente não sobreviva", acrescentando que as novas medidas de austeridade vão tornar mais difícil qualquer tipo de retoma económica. "La huelga general ha roto la barrera del sonido"
"La única huelga inútil es la que no se hace "